A critical obstruction no-call by 1B Umpire Jeff Kellogg capped Samurai Japan's 6-5 win over the MLB All-Stars in Game 5 of the international series as contact between first baseman Hotaka Yamakawa and batter-runner Mitch Haniger during an overthrow preceded Haniger's game-ending retirement at second base. BR Haniger pushes F3 Yamakawa away. The Play: With one out and one on (R1), Haniger hit a ground ball to Samurai Japan shortstop Sosuke Genda, who threw to second baseman Tetsuto Yamada, forcing out baserunner R1 Kevin Pillar, whose throw to first base was wide. As first baseman Yamakawa attempted to pursue the thrown ball, he and batter-runner Haniger made contact as Haniger attempted to advance to second base on the overthrow. Shortly thereafter, catcher Takuya Kai retrieved the loose ball and threw to second baseman Yamada, who tagged Haniger as he slid into second base for the game's final out, courtesy of 2B Umpire Hideto Fuke's call. 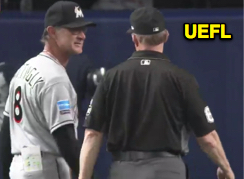 The Call: 1B Umpire Kellogg indicated that no obstruction or other illegal act had occurred by displaying a "safe" mechanic, explaining to MLB All-Stars Manager Don Mattingly that no rules infraction occurred up the right field line. Kellogg explains his ruling to Don Mattingly. Rule & Analysis: Obstruction is a rather straightforward concept ("the act of a fielder who, while not in possession of the ball and not in the act of fielding the ball, impedes the progress of any runner"), but it can get complicated during translation from the rulebook to application on the playing field. By now, we know that contact is not a requirement for obstruction, and that, under the auspices of Type 2/B obstruction (no play actively being made on an obstructed runner [BR had passed first base]), a fielder who has "made an attempt to field a ball and missed...can no longer be in the 'act of fielding' the ball" (Rule 6.01(h) Comment). Thus the only consideration is whether the first baseman's actions—beginning the instant that he "missed" his attempt to field the ball—impeded the progress of the runner. There is no such incidental "Ambrister tangle/untangle" exception for a first baseman...once he has missed the ball, any hindrance is illegal. And, because it must be said, the batter-runner is perfectly legal running where he is (no tag attempt = no out of base path consideration, but even so, the batter-runner may run through first base and decide to try for second at any point up the right field line...obviously, this would put him at liability of being tagged out and void the overrun protection, but as far as his position is concerned, he's 100% legal). Related Post: INT or OBS - Hammering the Catcher Contact Home (8/6/18). I believe this is an instance of obstruction. Gil's Call: In my estimation, the fielder impeded the batter-runner's progress and, accordingly, I have obstruction (type 2/B). On the accompanying video at the end of this article, watch the broadcast angle from the press box camera. At about the six-second mark, Haniger runs into the back of Yamakawa, after the overthrown ball has already exited the frame. As the piggybacking continues up the line, Haniger trips over Yamakawa's legs and stumbles as he attempts to advance toward second base. From the left-center field camera angle, it even appears Haniger briefly slows up as he braces for impact with Yamakawa. It is my opinion that this slow & stumble hindered the runner enough to cause him to be put out at second; had the impeding act not occurred, I believe the runner would have achieved second base safely and, for that reason, my award would have been to place Haniger at second base so as to nullify the act of obstruction (type 2/B). Bonus: Add a nickel to the "broadcaster confused obstruction and interference" jar. Jim Joyce's call is the gold standard for OBS. 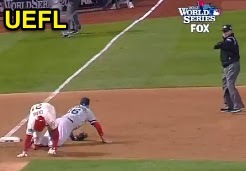 Precedent: During the 2013 World Series, 3B Umpire Jim Joyce and HP Umpire Dana DeMuth combined for a properly officiated game-ending obstruction call after Red Sox 3B Will Middlebrooks accidentally tripped up (e.g., "impeded") Cardinals baserunner Allen Craig, who in turn was thrown out at home plate, until the umpires imposed the obstruction type B penalty to "nullify the act" and award Craig home plate for the game-winning run. Middlebrooks at the time stated his dissatisfaction with the call, explaining he had nowhere to go after diving to field the poor throw (e.g., after having "made an attempt to field a ball and missed"). By rule, no matter what Middlebrooks did at that point, if he impeded the runner's progress, he was guilty of obstruction. For better or worse, the rulebook expects the fielder disappear after he has failed in his attempt to field the ball; the defense is not to be rewarded for a miscue. There is zero leeway given to the fielder in this "made an attempt to field a ball and missed" situation (other than, obviously, not rewarding a runner who goes out of his way to manufacture an obstruction call). Related Post: Reviewing Jim Joyce's Game-Ending Obstruction Call (10/26/13). Tying it Together: Like Middlebrooks, Yamakawa did not vacate the runner's path quickly enough after failing to field the ball, and, as a result, he inadvertently impeded the progress of the runner. Even though the impedance was inadvertent and accidental, it was not incidental, which means that, pursuant to OBR 6.01(h)(2), it was an illegal act. This play was no-called during the 2017 WBC. 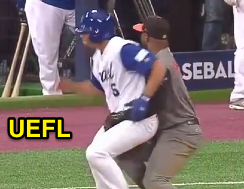 Related Play and Teachable Moment: We saw a similar—yet much more blatant—play during the 2017 World Baseball Classic at Gocheok Sky Dome when Team Netherlands first baseman Yurdell Decaster similarly failed to field an overthrown ball from second base. After the ball got by Decaster, Team Israel batter-runner Scott Burcham attempted to advance to second base and, according to replays, was physically wrapped up and momentarily restrained from advancing. 1B Umpire Chikara Tsugawa (who is presently in the States for the Arizona Fall League as part of an apparent MLB-NPB exchange program) no-called the Decaster-Burcham interaction, and Burcham was thrown out at second base on a close play. 1B Umpire did not see the obstruction play. In his Teachable, tmac quickly explained that 1B Umpire Tsugawa simply did not see the play because he was following the ball toward the wall along the first base dugout. Tmac also explained that in this situation, with only one runner to worry about (the batter-runner), the HP Umpire has the responsibility for adjudicating boundary issues involving the overthrown ball; the first base umpire's focus should be on the potential obstruction/interference/nothing issue between the batter-runner and the first baseman. 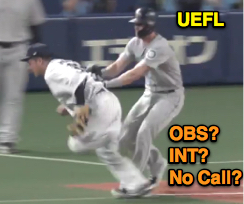 Back to Tokyo Dome: Unlike the 2017 WBC play, where our umpire made no signal, making it clear that the umpire did not see the play, on Wednesday in Tokyo, 1B Umpire Kellogg demonstrated the safe mechanic, which is the universal "that's nothing" sign.